Russia's defence ministry says two of its navy destroyers forced away a Dutch submarine to stop it spying on an aircraft carrier in the Mediterranean. The sub was 20km (12 miles) from the Admiral Kuznetsov at the time of the incident, the military said. Russia sent a flotilla to the eastern Mediterranean ahead of an expected resumption of air strikes in Syria. Nato said it was monitoring the ships in a "measured and responsible way". An official said the Western military alliance would not go into details but said it had been observing the fleet for some weeks. Is naval task force power play - or just theatre? The Russian flotilla's conspicuous voyage from Severomorsk in northern Russia, through the North Sea and the English Channel and into the Mediterranean, has rung alarm bells among Nato allies. There was no confirmation of the Russian military's claim of an incident, and the Dutch military tweeted that it would give no comment on submarine operations. It was also not immediately clear where the incident took place. However, one report placed the Admiral Kuznetsov around 100km (62 miles) north-west of the Syrian port of Latakia. Russian defence spokesman Igor Konashenkov said that two anti-submarine ships, Severomorsk and Vice-Admiral Kulakov, had "easily identified the submarine 20km away using the standard onboard hydro-acoustics systems and data obtained from anti-submarine helicopters". Although the sub had tried to evade surveillance, the ships tracked it for more than an hour and "forced it to leave the area of the aircraft carrier-led group", he said, condemning the Dutch sub's manoeuvres as "clumsy and dangerous". Although there was no official reaction from the Dutch military, Defence Minister Jeanine Hennis-Plasschaert said she thought it wise "not to go along with the Russian rhetoric". Dutch marine expert Jaime Karreman said that if true the incident was unprecedented. 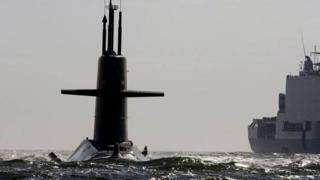 "It's pretty shocking that a submarine on a secret mission is discovered," he told Dutch TV.